As you can see I’m on a salad kick at the moment. Here’s one I made last night to have with the leftover roast lamb. Here’s my recipe if you’d like to try it. Your favourite French salad dressing. I cheated and used Praise fat free French dressing. Slice the eggplant into thick slices, brush with a little of the olive oil and place on a griller pan. Turn regularly so you don’t overdo the char. You want the eggplant cooked and with a little of that nice caramelisation. Slice the capsicum sides so you have wide strips, probably 3 or 4. Char grill these too. While the vegetables are grilling cook the couscous. Use whatever instructions come on the packet. The one I used is very simple. Bring 2 cups of water to the boil, add a little salt and a splash of olive oil. Remove from the heat and stir in 2 cups of couscous with a fork. Put the lid on the pan and leave OFF the heat for 5 minutes. After that time fluff up with a fork, add a dollop of butter or margarine and stir over a low heat for 2 minutes. 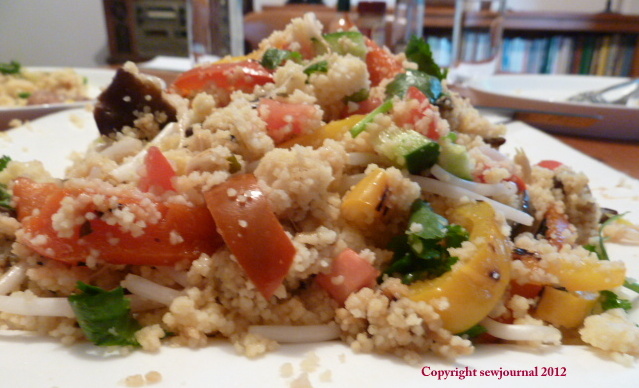 In a large bowl or on a large platter place half the couscous. 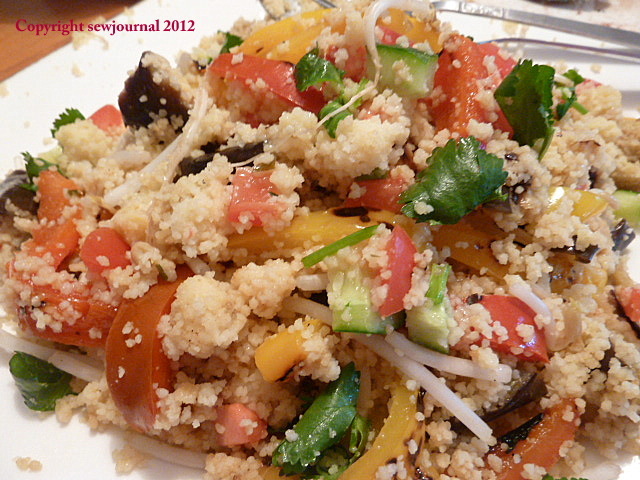 Slice the cooled, cooked eggplant and capsicum into thin strips and then fork through the couscous. Add the rest of the couscous and then the chopped tomatoes, cucumber and coriander. Mix the whole salad well. Then sprinkle over your French dressing to taste and gently mix again.